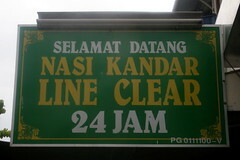 The white type on this telegraphic sign offers a welcome and proclaims that they're open all day and all night; "Line Clear" comes from a constant exhortation to the staff (can't keep customers waiting!). 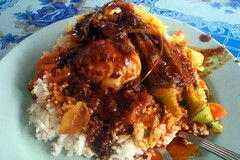 As for nasi kandar, the name refers to rice (nasi, in Bahasa Malaysia) once served by roaming peddlers who carried their wares suspended across their shoulders on a yoke (kandar). Though hard to see from this angle, my okra-heavy order (rm 5) soaked the rice in several sauces — essential, according to numerous nasi kandar aficionados. Accompanied by a side of fried chicken.